Oramed hyped results from an insulin pill safety study, then made it difficult to find the actual data. JERUSALEM (TheStreet) -- You're looking at the data which supposedly supports Oramed Pharmaceuticals' (ORMP - Get Report) claim last week that its experimental insulin pill ORMD-0801 is safe and well tolerated, based on the positive outcome of a small and short (one week) phase IIa study. 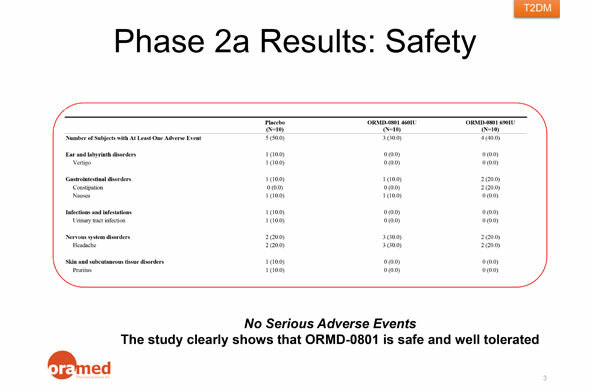 The slide is hard to read but its shows adverse events reported by 40% of type 2 diabetics treated with the high dose of ORMD-0801. The adverse event rate in the low-dose ORMD-0801 arm was 30%. Fifty percent of the placebo-treated patients reported adverse events. Ten patients were treated in each arm -- 30 patients total. For one week. And from this, Oramed says, "The study clearly shows that ORMD-0801 is safe and well tolerated." Really? I'd love to see the statistics supporting Oramed's claim. Of course, they're missing from the chart. Also missing is any disclosure of ORMD-0801's efficacy. The company claims all secondary endpoints of the one-week study were achieved but no data or proof has been provided. 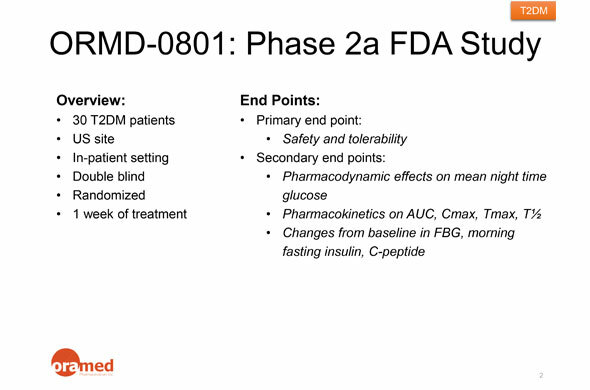 It's a shorter list of secondary endpoints compared to the description of the ORMD-0801 study on ClinicalTrials.gov. Most importantly, Oramed disappears the efficacy endpoints comparing ORMD-0801 to placebo. There's an interesting story behind how I found these ORMD-0801 slides. Oramed issued its press release announcing positive results from the phase IIa study last Thursday Jan. 30, but neglected to include any real data. I emailed Oramed's media handlers, asking them to share actual ORMD-0801 data from the study, as the company had promised three days earlier. I didn't hear back from anyone Oramed until Sunday, when I received an email from Michal Lazarus, the company's office manager. He directed me to the ClinicalTrials.gov listing for the ORMD-0801 phase IIa study (which doesn't have any of the data I had requested) and told me that results from the study would be presented at an upcoming scientific conference. But then I went hunting on Oramed's web site and found, tucked away at the bottom, of a this page, a link to the slides I shared above. Why didn't Lazarus point me to the data slides? It's as if Oramed doesn't want anyone to see the actual data from the ORMD-0801 study, or at least, make it difficult to find them. Oramed's handling of the ORMD-0801 data smacks more of stock promotion than credible drug development. These latest insulin pill data demonstrate nothing, says Diabetic Investor's David Kliff, a veteran analyst of diabetes drug development. Oramed has proved essentially that they can do more studies, WOW. They haven't proved their miracle drug is better than existing medications or that patients using this miracle drug experience fewer side effects or achieve better outcomes. All they have proved is that this one week study - a whole seven days- was that they could do more studies which will hopefully last more than a week. Please pardon Diabetic Investor for being so blunt about this but after more than 20 years of covering this industry it's gets a little tiring to see everyone get so excited over data which is completely worthless. Oramed shares have been on a quite a run, tripling in value since December on the anticipation of these latest ORMD-0801 study results. But the stock has lost 20% since the company's Jan. 30 announcement. Oramed shares are down 2% to $21.70 in early Monday trading.